Mazda has been a popular choice for many thanks to its quality design, dependable performance, and affordable pricing. Mazda offers a range of vehicles to meet the needs of many, from modest sedans to flashy sports cars and large family SUVs. Should you get into an accident, you need to work with a certified Mazda body shop in Mesa that knows exactly what your vehicle needs to get back to factory conditions. Excel Collision and Glass Centers has the certified technicians you can trust to get your Mazda in the best shape even after a bad accident. Our technicians are dedicated to getting the best results with every collision repair job we do. We know that you’re busy, and getting into an accident can really throw your life out of order. You have to juggle calls to the insurance company, the other driver and the body shop, and you have to manage getting to work and taking care of your family all without a vehicle. We do everything we can to make that process a little easier. That starts with maintaining numerous locations throughout Arizona, including Mesa and the surrounding area. That way, you can get the service you need easily while also staying close to your home or office. Each of our locations maintains flexible hours to try to accommodate your schedule. We can also assist with pick up and drop off where needed. Mazda is another of the Japanese car brand that is appearing on the streets more and more over the years. We understand how popular this brand is going to be in the future, especially their RX model line, and that is why we are prepared to repair all of them in our convenient locations in Mesa. With a direct certification from Mazda, we are authorized to work with original manufacturer parts to make your Mazda car as good as new. Accidents tend to happen at the less expected moment, so it is important to have a contingency plan and an insurance company if you ever end up in one. Excel Collision Centers works with all the insurance companies available in the business, so there won’t be an issue for our workers to bring your car back in prime condition. Having original manufacturing pieces and skilled mechanics with determination to be the best is what makes us one of the best collision repair companies in Mesa. Dents, bumps, scratches and paint damage are caused by small things like supermarket carts or a car that didn’t break in time while driving in a lane. Many things can cause damage to your vehicle, but Excel Collision Centers is prepared with the right tools and expert mechanics to make your car look brand new once again. Whenever you bring your Mazda car for a dent removal and repair, our efficiency lets us complete the task in under a couple of hours instead of days compared to other collision repair companies. ✓ Performing the highest quality collision repair to get your Mazda back to its pre-accident condition or better. ✓ Getting ongoing training so that we always have the latest skills and tools to get the best results for your Mazda. ✓ Offering friendly and professional service at every level of contact, from your first phone call to the final delivery of your vehicle after repairs. ✓ Making your repairs as convenient as possible by offering numerous locations, extended hours, and additional services like pickup and drop off. We don’t want to just get another sale. We want to build lifelong relationships with our customers so that we are their go-to auto body shop when they have an accident. We are confident that you’ll notice the difference that our service makes the minute you make your first phone call to one of our shops. We back up our work with a lifetime warranty. For as long as you own your car, we guarantee that the work we performed will be without defect. You can rest easy knowing you have that kind of backing behind your collision repair. We have a long line of satisfied customers who can attest to the quality of the work we do, and we hope we can add you to their ranks. 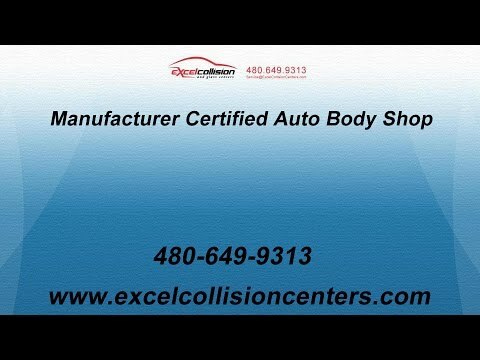 Call us today to schedule an appointment for your collision repair at our body shops in Mesa. "Each time they have given me a completion date and kept me informed during the repair process. Their facility is always very clean, organized and professional." "No better place to trust with your vehicle. The quality of their work, knowledge of their employees, and convenient locations make the entire repair process seamless."